We have said it before and will say it again; It is absolutely amazing what you can experience in one day! Especially if you get up at 3 am to catch a flight from one country to another in order to get to a third. Case in point. Our flight from Tbilisi Georgia to Bodrum Turkey, via Istanbul, departed at 6:05 am. The hotel had arranged a cab for a reasonable fare (about half of what we were quoted at the airport when we arrived). We were early but still surprised to see huge crowds in line for security. The 737 left on time and we arrived in Istanbul at sunrise. Looks like a beautiful city and we hope to explore it one day. For now we were on route to our Greek island of choice, Symi. Bodrum, located on the Mediterranean Sea, has a twice weekly ferry to the island. The lineup at the passport control in Istanbul was horrendous and we quickly realized we would probably miss our connecting flight, unless we jumped the line. They had thirty check points but were only manning three on this busy morning??? Lots of anxious faces in the crowd. We decided it would be a waste of energy to panic as many people seemed to be in the same situation. We did miss our connection but got new boarding passes at the Turkish Airline counter for a flight three hours later. We soothed our souls with a Starbucks as the 3 am start began to take a toll. The plane to Bodrum, an old beater purchased from Ryan Air, got us to Bodrum safely. Another cab from the airport to our hotel, located within walking distance of the ferry terminal. We had only booked one night as we were anxious to get to Symi to relax. 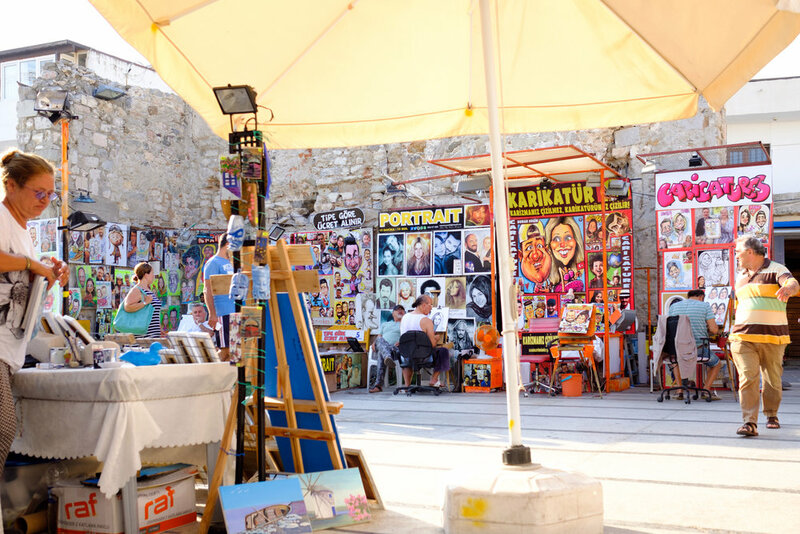 Bodrum was a much larger city than anticipated with hundreds of hotels, countless restaurants, gift shops and cafés. An interesting scene played out at the end of the afternoon as restaurant staff cleared the beach, levelled and cleaned the sand, and then set up dining areas along the entire stretch. I’ve seen restaurants along the beach but never done to this methodical extent. The corniche had a wonderful vibe and we could probably have spent two or three days here taking in the atmosphere. It was very affordable. However, our goal was a quieter, more idyllic, tranquil and original scene. As usual Di had done the research and Symi, Greece seemed to be ticket. An early morning ferry and we were on our way.